Named as one of this year’s 100 most powerful women in the UK by the BBC’s Woman’s Hour, Stella Nina McCartney has more than earned herself a name in the fashion industry. 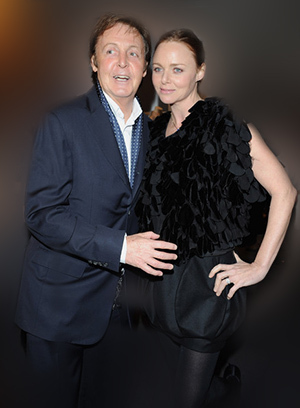 Growing up with parents Sir Paul and Linda McCartney, Stella had her fair share of hardships, from complications during her birth to being bullied at grade school. Fortunately, the young lady overcame all of the harassment and managed to embark on a successful career. Born by emergency caesarean section, the young lady inspired Dad to come up with the name of the popular rock group, Wings. Paul claims that she was born on the wings of an angel. While there must have been some extraordinary perks to growing up with two of the richest and most famous parents in the world, Mom and Dad tried to give Stella and her siblings a customary upbringing. They were all sent away to schools in East Sussex, where Stella was the victim of bullying. Even if Mom and Dad are not fab rock stars, bullying is a problem that can affect countless children around the world. Part of parenthood is teaching kids the necessary skills for living, learning, playing or working, even if it is with somebody who is trying to intimidate them. Just this week, 15-year-old Jordan Lewis shot himself in Carterville, Illinois wrote a suicide note explaining that he could no longer endure being bullied. Last month, the Los Angeles Times ran an article about two children from Lakeland, Florida accused of bullying 12-year-old classmate Rebecca Ann Sedwick until she jumped from a silo at an abandoned cement plant. The crime was online harassment, also known as cyberbullying. According to Rebecca Desfosse, a Boston University researcher on parenting, here are a few steps a parent can take when dealing with a bully. Talks to your kids. Find out if they are ever being bullied. You can then talk to a parent, teacher or counselor before things get ugly. Teach your child to avoid confrontation, perhaps by taking a different route to class. If you can get your son or daughter to be brave and stand up to a bully, this may be enough to get him or her to back down. While teaching your kid to stand his or her ground, do not encourage him or her to fight back physically. Encourage your child to be around friends, giving a bully less ammunition. Convince your son or daughter to hold in his or her emotions around a bully. Do not let a bully see him or her cry. A child should wait until he or she is with somebody who they can trust before displaying true feelings. Inspire self-confidence, perhaps with sports or a musical instrument. Convince your child to be a bigger man or woman by simply walking away from a bully. Take away a bully’s ammunition. If a bully teases your child about his or her shoes, perhaps try dressing your little one in a new pair. Persuade your kids to support kids who are being bullied. By showing them support, they will most likely make a new friend or reinforce an old alliance. Despite being harassed, Stella learned to rise above the bullying. It even drove her to success. Since the age of thirteen, the artist has been designing clothes. Being a vegetarian, Stella refuses to work with leather, fur or wool, as well as any other fabrics derived from animals. By the time she was 16, Stella was already working with some of the biggest names in English fashion. The woman’s 1995 collection was worn by supermodels Kate Moss and Naomi Campbell. Two years later, she was named the Creative Director for Chloé in Paris, where she has met substantial commercial success. Relying on a signature style of piercing femininity, the trendsetter partnered up with Gucci in 2001. A new collection was launched, conveniently named Stella McCartney. There are now 23 stores located in London, Rome, Tokyo, Manhattan, Miami and Hollywood. She even designed clothes specifically for Madonna and Annie Lennox’s world tours. Meanwhile, the Stella McCartney collection is distributed to more than 50 nations around the globe. The woman has gone on to launch her own perfume, Stella, as well as her own organic skin care treatment, CARE. To top it all off, a long-term collaboration with Adidas developed in 2004. Using the name adidas by Stella McCartney, she now makes sportswear for women, designed for running, swimming and tennis, among other activities. A few years later, Stella began making baby accessories and bags for mothers with small children. By 2010, the Stella McCartney Kids collection became available in department stores. The upscale clothes have been designed for newborns and kids up to the age of 14. Stella tied the knot with British publisher Alasdhair Willis in 2003. Raising four children, the pair is now learning the ins and outs of motherhood and fatherhood for themselves. Like Paul and Linda, Alasdhair and Stella do their best to give their kids a normal life, free from the spotlight, as well as from bullying. While both Mom and Dad were rock stars with divine artistic skills, Stella has overcome all of her issues with being bullied. Born on the wings of an angel, the young McCartney has earned her name as an icon in the fashion industry, as well as a wonderful parent. Take a look at the Stella McCartney collection posted on her official website. Fans of high-end fashion can also follow Stella on both Facebook and Twitter.